Sometimes you just have to braise greens. Why? Because this time of year they start stacking up in the fridge — kale, curly kale, spring collards, beet greens and swiss chard to name a few. Greens make for a wonderful dish to have in the fridge during the week; you can eat them as a side or combine with other ingredients to make some pretty interesting meals. Today we will just make the side — later in the week we will stuff a sweet potato! 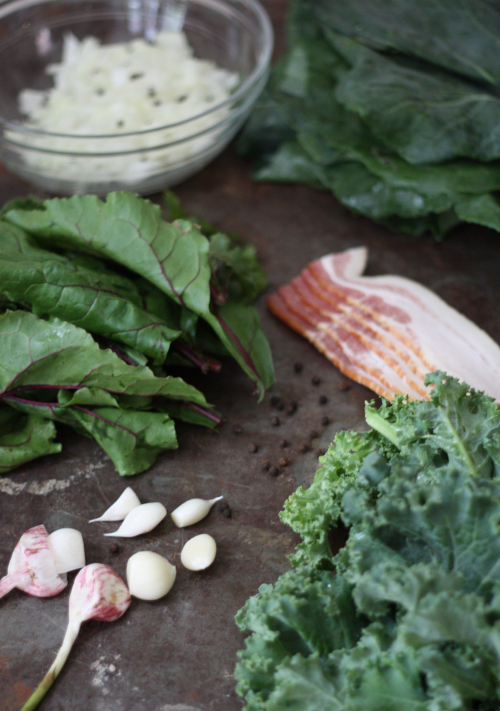 Last week's Farm Table box provided collards, curly kale, and beet tops perfect for braising. 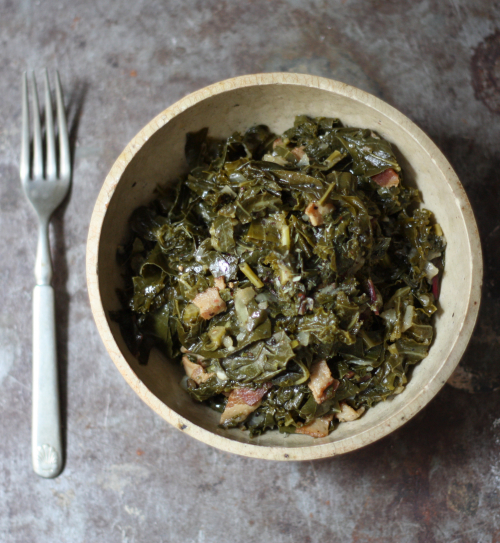 You want about 2 pounds or more of greens, which may sound like a lot but trust me, it will cook down. Fry the bacon in a large pot until crispy. Add the onion and cook until soft 5-7 minutes. Pour in the chicken broth and add the greens with a pinch of salt, pressing down with a spoon and stirring until wilted. This might need to be done in batches. 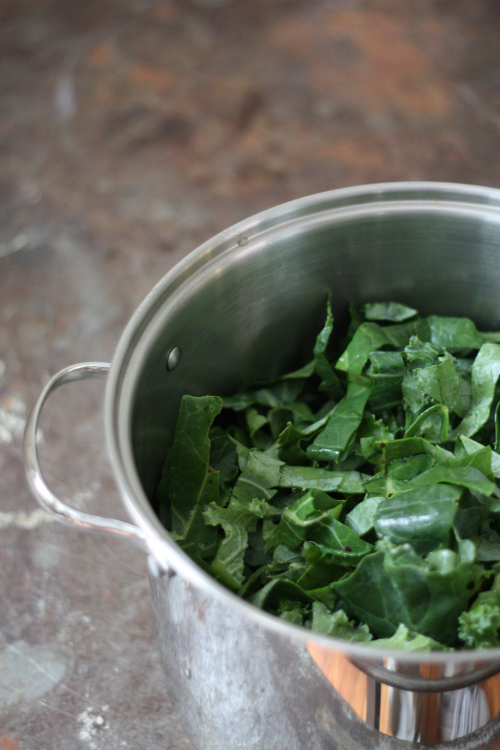 Once the greens have wilted, cover and simmer for a minimum of 30 minutes, stirring occasionally. 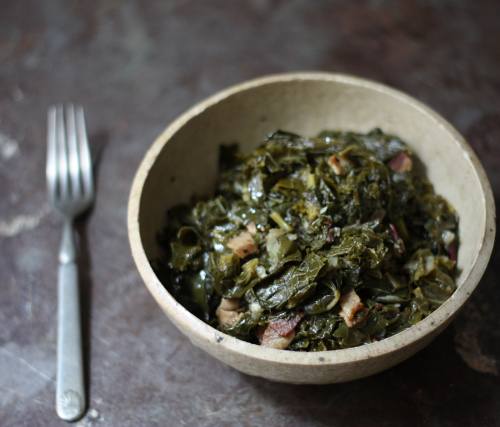 Personally, I leave the greens on low for up to 2 hours which I think enhances the flavor. 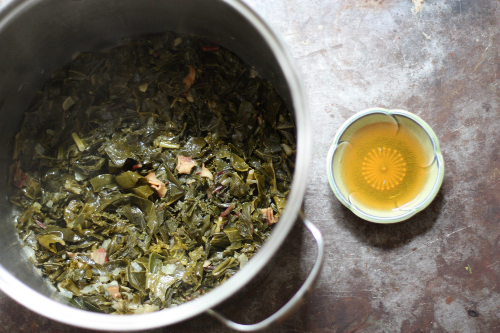 When the greens have finished cooking down, pour in your vinegar, stirring and taste. I like a little more vinegar for the bite it gives, so it's really a matter of preference, but 3 tablespoons minimum. Sprinkle fresh ground pepper, a pinch of crushed red pepper and you are ready to serve or save it for later in the week. You will be surprised at how tender and sweet the greens become. You can now sit back and feel like a true southerner no matter where you are from, because you truly have fixed a traditional southern dish!